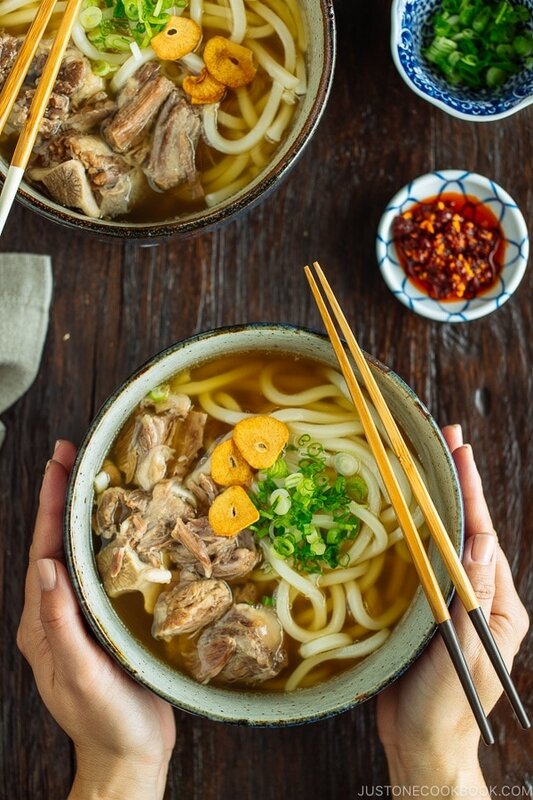 Pressure Cooker Oxtail Broth is richly flavored and packed with nutrients – a perfect beef stock for many Japanese soup recipes including Japanese Udon, Japanese Curry, and Japanese Fish Cake Stew (Oden). 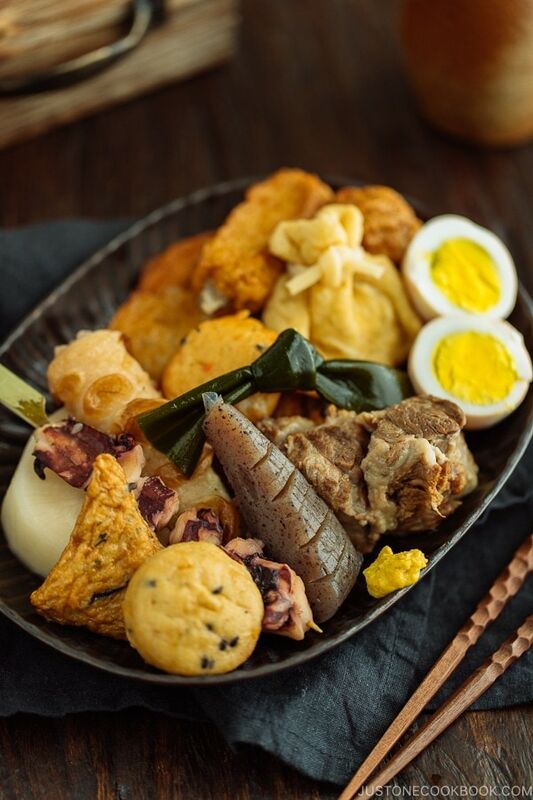 Japanese dishes can sometimes look deceivingly simple like a basic bowl of ramen or udon. But the magic is in the broth. Whether it is dashi, pork bone, miso, chicken, or beef, your bowl of Japanese noodles will taste amazing! 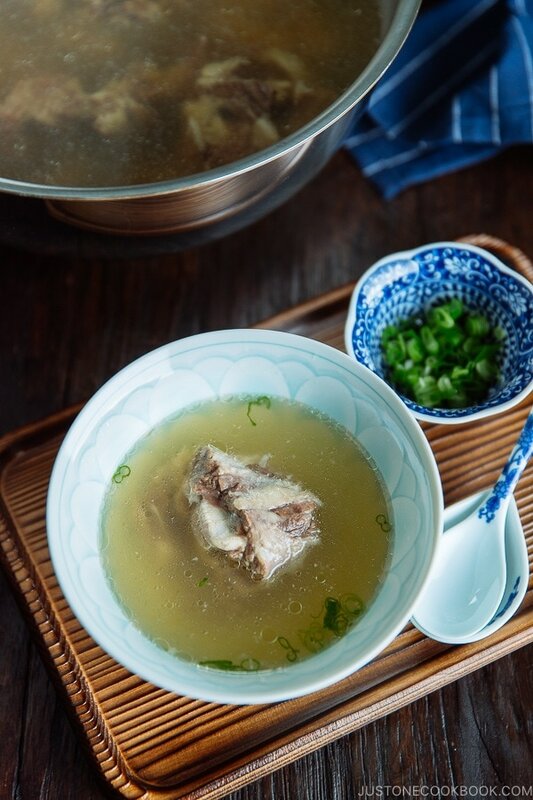 Today, I made a rich, healthy beef broth made with oxtail that is perfect for cooking Japanese soups and stews, and even enjoying as it is for a warm pick-me-up on a cold winter day. 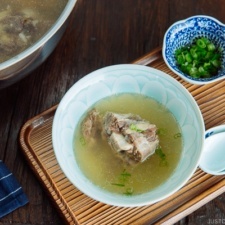 Make a lot of this oxtail broth because you will find so many ways to use it in your cooking. There are many oxtail soup and oxtail broth recipes online, but a quick note on my recipe. I made this instant pot oxtail broth recipe so that I can use this broth (and meat) as a base to specifically make Japanese recipes. Therefore, this recipe is a simple, quick version without many vegetables that other broth recipes may include. 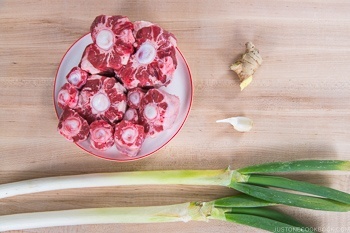 To make the best Japanese-style oxtail broth, the key is in the cooking process. In Japanese cooking, we try to achieve the “clean and refined” taste to enjoy the true flavors from the ingredients themselves in dishes. 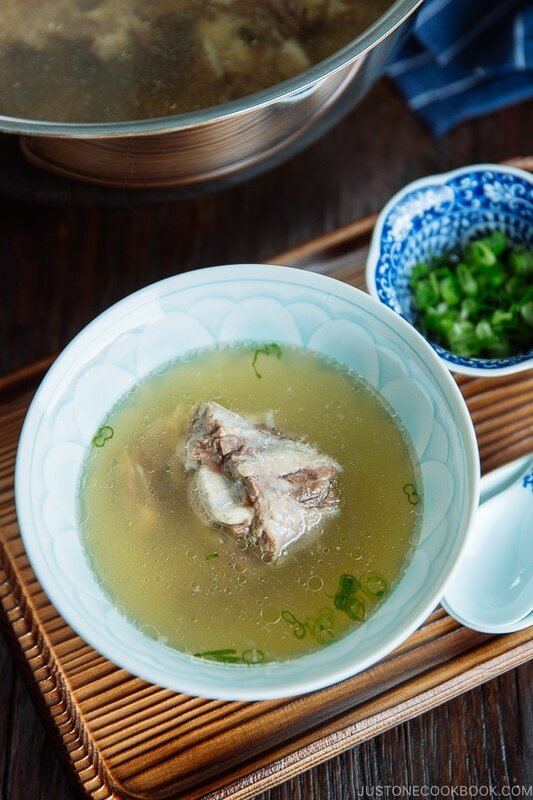 So to create an authentic Japanese-style beef broth, we soak the oxtail in water for at least one hour, then pre-boil the oxtail and meticulously rinse off the layer of scum. 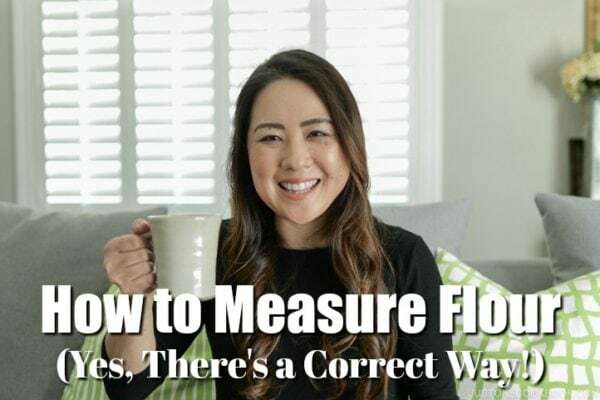 This method ensures a pure, balanced flavor in the broth and also gives that distinctively clean look to Japanese dishes. As you might remember me mentioning in my Pressure Cooker Oxtail Soup recipe post, I had never eaten oxtail in Japan. It wasn’t until I came to the US in the late 90’s that I discovered it. Oxtail dishes (especially soup) is well-known in Miyagi Prefecture where the use of beef tongue in dishes is considered its regional food. But other than in Miyagi Prefecture, oxtail wasn’t a common Japanese ingredient. That changed in 2003 when the big Korean Wave (韓流) hit Japan with the popular drama “Winter Sonata”. Korean cuisine and ingredients became more accessible in Japan, including oxtail. Though it’s still not a common ingredient to cook in Japanese households. Don’t let me stop you there! 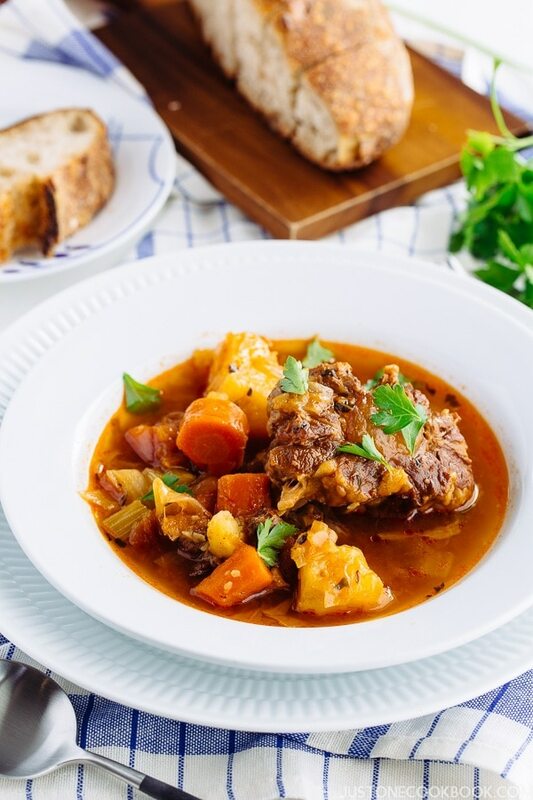 Pressure cooker oxtail broth is slurp-it-up delicious and so restorative this time of year that it can be used to enhance many Japanese dishes while keeping you healthy, happy, and warm. 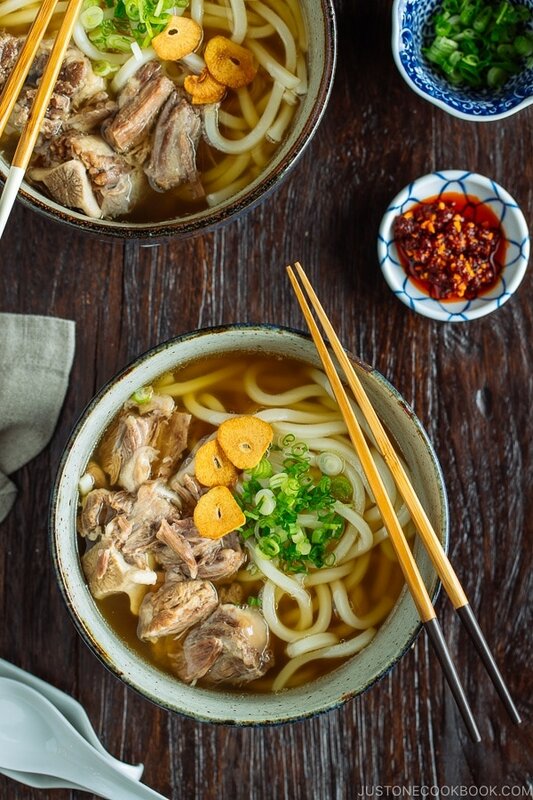 Pressure Cooker Oxtail Broth is richly flavored and packed with nutrients - a perfect beef stock for many Japanese soup recipes including Japanese Udon, Japanese Curry, and Japanese Fish Cake Stew (Oden). In a bowl, soak the oxtails in water for 1-2 hours. Change the water every half hour. This step will help removing blood from the oxtails. Drain the water and transfer the oxtail to the Instant Pot. Add 6 cups water (or just enough to cover the oxtail) and bring it to a boil. Instant Pot manual says not to cover when using Saute mode, but I use a glass lid from another pot (so I can see inside) and keep it covered until boiling. The lid is optional but it helps to speed up the boiling. Press “Saute” button on your Instant Pot. Once boiling, remove the lid if using and cook for another 5-10 minutes. Press the “Keep Warm/Cancel” button on the Instant Pot to stop “Saute” mode. Drain the water and clean the oxtail under running cold water. Set aside and clean the pot. Cut the negi (or green onion) to separate green and white part. We only use green part for cooking the oxtail. Slice the ginger with skin on and smash the garlic. In a cleaned pot, put the oxtail, negi (or green onion), ginger, and garlic. Pour 8 cups water. Make sure the oxtail is submerged. If you use more than 2.5 lb oxtail, make sure that the water is not exceeding more than 2/3rd the capacity of the pressure cooker. Cover and lock the lid on the pressure cooker. Make sure the steam release handle points at “sealing” and not “venting”. Press the “Manual” button to switch to “High Pressure” cooking mode. Press “plus” button to change the cooking time to 60 minutes. If you’re using a stove-top pressure cooker, you won’t have any buttons to press. Just cook on high heat until high pressure is reached. Then reduce the heat to low but maintain high pressure for about 60 minutes. When it is finished cooking, the Instant Pot will switch automatically to the “Keep Warm” mode. Let the pressure release naturally, about 15-20 minutes. After de-pressurizing is completed, unlock the lid. Set a fine mesh sieve over a large bowl and strain the broth. Discard the aromatics and add the meat back into the broth. Cover and let cool completely. Store in the refrigerator overnight (or at least 4 hours till fat solidified). If you are using the broth NOW: You can’t get rid of the fat as much. Skim off the best you can. Use the broth and meat for the recipe you’re cooking. Otherwise, season the broth with salt (Tip: the right good amount of salt is important for taste). 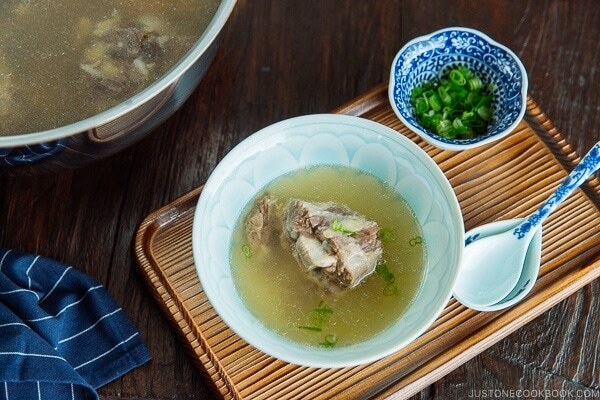 Serve the soup and meat in a bowl topped with green onion. Once the fat is solidified on the surface, remove the layer of fat. You can use it for other recipes or discard. Transfer to the pot (or back to Instant Pot) and reheat the broth. Use it for the recipe you’re cooking (and season accordingly). Or season with salt (Tip: the right good amount of salt is important for taste), and serve the soup with meat and chopped green onion or your choice of herbs. If you use regular pot (without pressure cooker), cook the oxtail on low heat for 3-4 hours, and add water as needed. You can store the broth in the refrigerator for up to 3 days and in freezer for up to 3 months. I have been making Oxtail soup for years. I use 1 diced onion, sliced carrots, kosher salt, white pepper and thyme. We eat the meat with horseradish. Your method with this cut of meat is very informative. 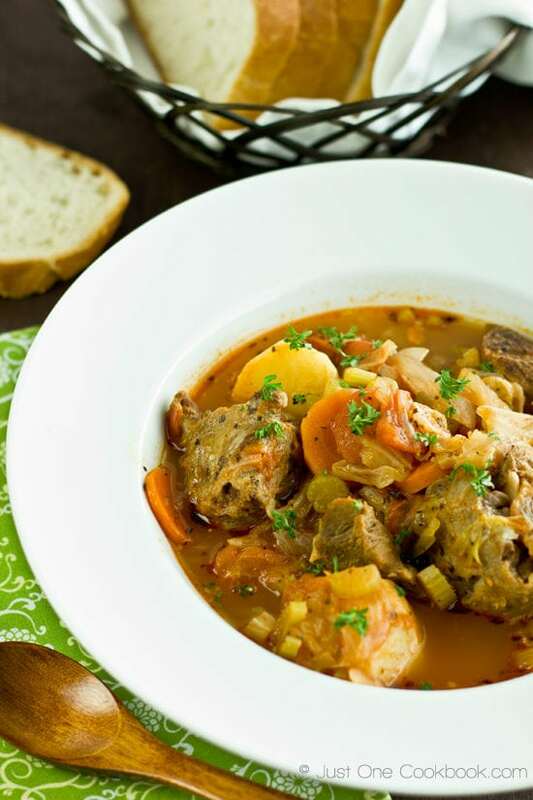 In my own tradition of cooking – French, Spanish – oxtail is a very traditional. Your recipe combines precision and different flavors with a very pure result. A new insight in something I assumed I already knew. Many thanks. Love your recipes, Nami, and watching your videos! 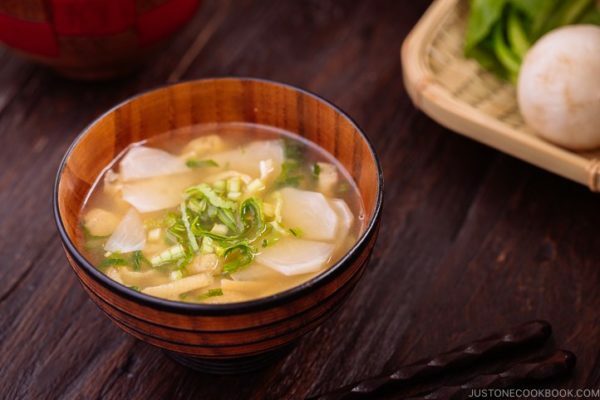 I’ve not made any yet, but really enjoy Miso soup (I have a bottle of instant Miso in the fridge, and enjoy the miso at least as well in the morning as any coffee. I intend to get some oxtails and try to follow your recipe for the broth and then some of the soups… Makes me hungry just watching your videos!! I’ve been subscribed to your e-mails for awhile. They’re great!! I always enjoy your recipes. Can I use beef shanks instead ox tails? If so, do I cook differently? Hi H Lee! Beef shanks are not fatty and boneless so I don’t know if you can get rich and good broth from it. You can add the beef shanks for eating it, but not the broth, maybe?